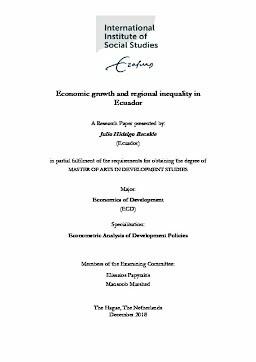 The objective of the present research paper is to analyse the relationship between economic growth and regional inequality in Ecuador. For this, it relies on the use of regional gross value-added estimates for the provinces of Ecuador in the period 2007-2016. The analysis makes use of a parametric and a non-parametric approach to determine if there has been a reduction of the inequality among provinces, along with the causes of unequal regional growth. The results indicate that regional inequality has decreased in the period of analysis, mainly driven by the reduction in the growth rates of the national econ-omy. The analysis also suggests that there exists a process of absolute and con-ditional convergence since poor provinces are growing faster than the rich ones. Besides, the outcomes of the non-parametric approach indicate that the disper-sion of the product of the provinces has reduced, and the gap between poor and rich provinces have decreased between the period of analysis.